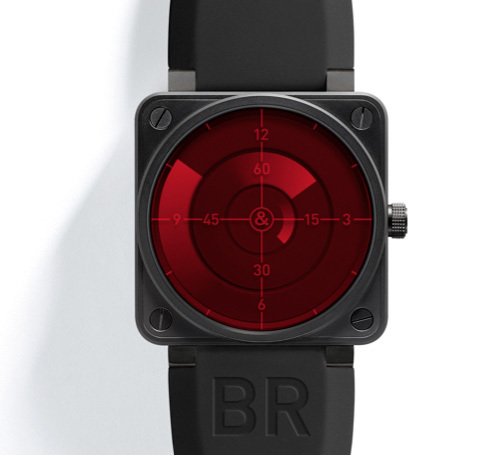 Bell & Ross BR 01-92 Red Radar Edition Will Appeal To Air Traffic Controllers | OhGizmo! First unveiled at Baselworld, Bell & Ross’ Red Radar edition is designed to look like the bona-fide radar screens used in air traffic control towers, submarines and other movie locales where tensions run high. But as you can see in this video shot by Hodinkee at Baselworld, the analog watch cleverly uses red tinted crystal and a disc system to recreate the sweeping arm-look of an electronic radar display. Like the original Bell & Ross BR-01 92, the Red Radar edition will only be available in a limited run, though 999 pieces this time for around $5,500 each.